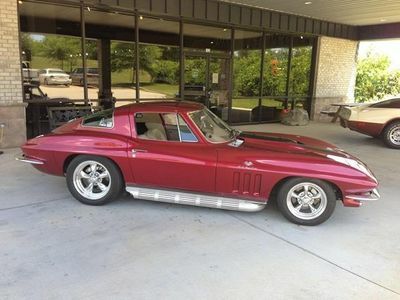 Professionally built 1966 Corvette Coupe, frame-on restoration with new 2004 GM Corvette crate LS-6, Z-06 engine with Magnusson supercharger and Tremec TKO 600R, 5 speed transmission, power steering and air conditioning. 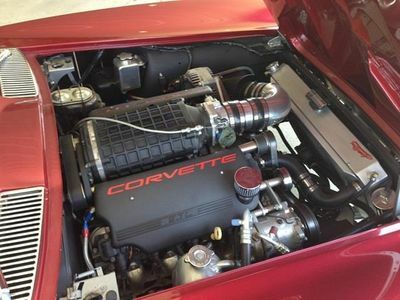 The fuel injection is controlled by a GM computer system and aftermarket wire harness. 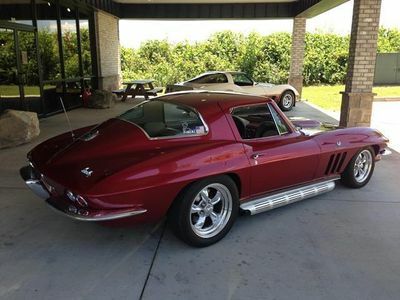 All of the original suspension was completely rebuilt with slight modification to accommodate the LS-6 engine; the brakes are all stainless steel calipers and dual master cylinder. The engine and transmission utilize polyurethane mounts with all driveshaft and side shaft u-joints replaced with solid, heavy duty units. It has a custom built, aluminum, Auto-Rad radiator with electric fan and shroud. 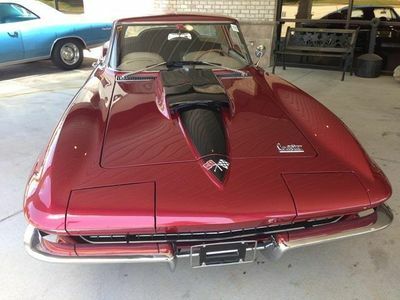 The body was soda blasted, treated and all fiberglass repaired and painted in 2013 Cadillac pearl/metallic red with a 67 style stinger hood. 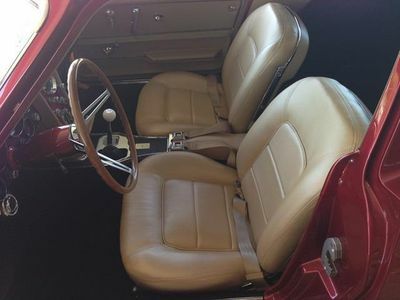 The interior is a complete, all new, Al Knoch, special ordered, custom tinted, Sand Dust color combination that includes all panels, seat backs, headliner, dash pads, etc., with the seats rebuilt and covered in matching ultra leather. The interior was completely covered in Dyna-Mat insulation and new, black, auto custom carpet installed over the Dyna-Mat and padding. 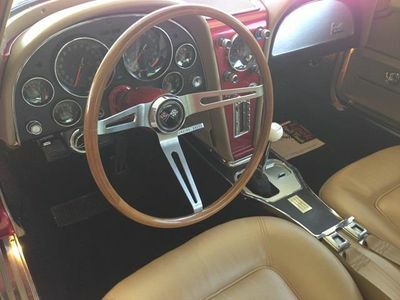 The steering wheel is an original meticulously restored teak wheel. The clock is converted to electronic operation. The original radio is in the dash with an auto custom sound head unit mounted in the glove box with remote control. It has Vintage air/heat/defrost with the controls dash mounted replicating the original factory A/C in mid year cars. The chassis dyno sheet shows 500 horsepower and 545 lb. ft. at the rear wheels at 5200 rpm. 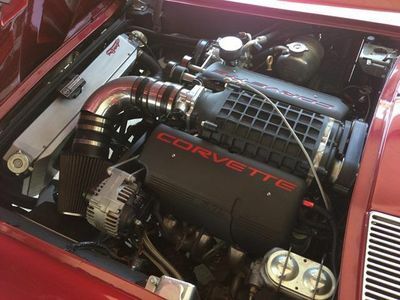 The fuel system has since been upgraded and the engine is somewhere over 700 horsepower at the crankshaft though it idles completely smooth with factory side pipes. This car is stunning to look at and drive with unbelievable gas mileage. 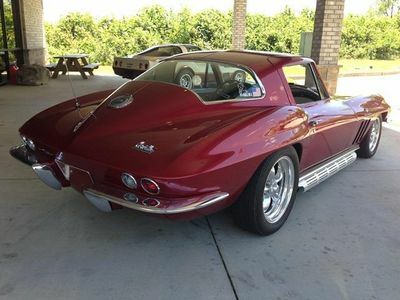 It drives absolutely smooth and wonderful with no evidence of the serious horsepower that is present.